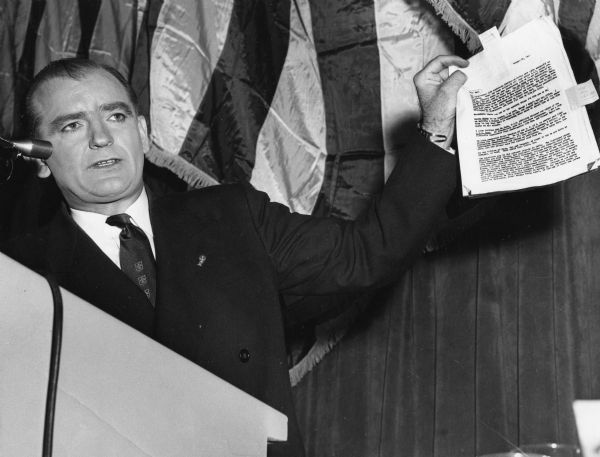 Senator Joseph R. McCarthy of Wisconsin holding up a report on Democratic Presidential candidate Adlai E. Stevenson that linked him to a host of extreme left-wingers, even Alger Hiss. This address was broadcast on national television. Restricted: Corbis has purchased copyright to all pre-1991 images housed in the UPI office. For reproductions and licensing rights contact copyright holder.